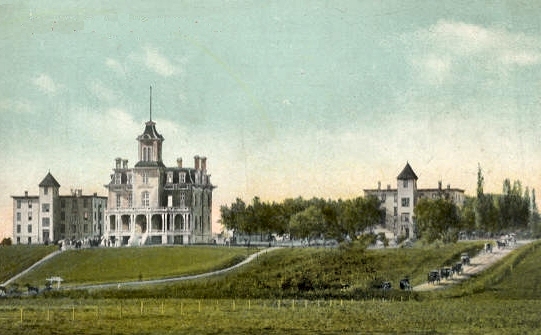 Humboldt College was a dream of founder Stephen H. Taft, that blossomed into fruition, thanks to investors from back east, with building construction started in 1870. It operated for several years, charging no tuition, with approximately 50 students in attendance by 1872. They lost some students when it was deemed necessary to start charging $5 for tuition. Taft handpicked the faculty members, assuring a high quality of education for the students. It was a social and cultural center for the community for the next eight years, with the first class graduating in 1876. Financial problems caused it to close in 1880, and then from 1883 through 1884, a Humboldt Academy and the Normal School held classes in the building. It is described as a 40 x 60 ft., three-story building, with a basement. The first floor held three recitation rooms and a library room. The second story was all one room, but was soon to be divided into two rooms, for chapel and music room. The third story was divided into dormitory rooms. The roof was iron. The basement was fitted up for a dining room, kitchen and cellar. In 1895-96, Humboldt College took on a new lease for life, when J.P. Peterson and A. L. Ronell reorganized it under the more practical lines of a business school, with a varied curriculum, shifting to the practical line as the years went by. Peterson had two new dormitories built, along with a large, impressive home for his family at the back of the property. Students paid $32.60 in advance for tuition, board and room for 12 weeks, or $88.60 for a school year. Their motto was, " It's cheaper to come here and get an education than it is to stay at home and do nothing." By 1910, board was $1.75 or $2.25 weekly. According to one student, everyone had three prunes for breakfast, but only those paying the higher price for board had cream for their oatmeal. Free tuition for the first student from a county which had not had a student previously, rebates for the second family member enrolled, railroad repayment costs, and lower costs if tuition and board and room were paid in advance were some of the enticements offered. Work on the college farm was also available. Although there were 14 departments, the commercial was the strongest, with such practical courses as shorthand, typewriting and bookkeeping. Practical methods using simulated banks, offices and other businesses made the courses more meaningful to students. History at this point is a bit vague, but the general consensus is that promised tax breaks for the college made by the town eventually involved the tax exemption extending to county funds, and although not a large amount of funds was involved, Mr. Peterson became very upset when the people of the community and surrounding areas failed to respond in any way to the predicament. As a result, Mr. Peterson left Humboldt in 1916 and established Humboldt College in Minneapolis, MN, where it existed as a business institute for over 60 years, closing in 1978. The last class to graduate from the Humboldt College here was the Class of 1914. The buildings were used during the 1916-17 school year by the local high school, when a new facility, being built in town (on the present junior high school site), was not finished it time for the fall classes to begin. The college buildings then stood idle, until Fred and Nellie Bradburn purchased 66 acres of the original 240-acre property from J. G. and Clara Devine. He offered the buildings for sale for $1,000, and although one citizen tried hard to raise that much money, he failed to do so, so the buildings were razed and Mr. Bradburn encouraged citizens to take pieces as souvenirs. Some of the larger pieces were taken to farms in the area, the marble trim on the main buildings was used in constructing the entry pillars at Union Cemetery, and some slabs of concrete went to other towns and some for in-town use.